Where there is love there is pain…and sometimes death. What if three upstanding people from one of the most modest cities in America allowed their proverbial Midwestern values to run amuck? What if a successful and devoted married couple from Michigan who live in a lap of luxury have their marriage bond intruded upon by an attractive woman who through love and emotion helplessly connects with them through a chance encounter. 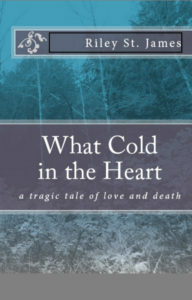 What if through the misfortunes of the resulting love triangle there is a mysterious death? Then you would have: What Cold In the Heart.